Queen of the House of Boys: Junk Market Style Approved Vendor Show! Junk Market Style Approved Vendor Show! We are headed to Minnesota! Remember when I went to Mudd Lake? You can also read about my first trip here. Mudd Lake Furniture is this completely awesome antique furniture store which is owned and ran by Bob Kratch, ex-NFL player! Well...I literally dreamt of living in that store for a good month after that trip...and since I just bought a new house triple the size of my last house...daydreams of returning soon have been in my mind. Not that I needed a reason...but now I have an awesome reason! Mudd Lake is holding a "Junk in the Trunk" show July 22nd through 24th! 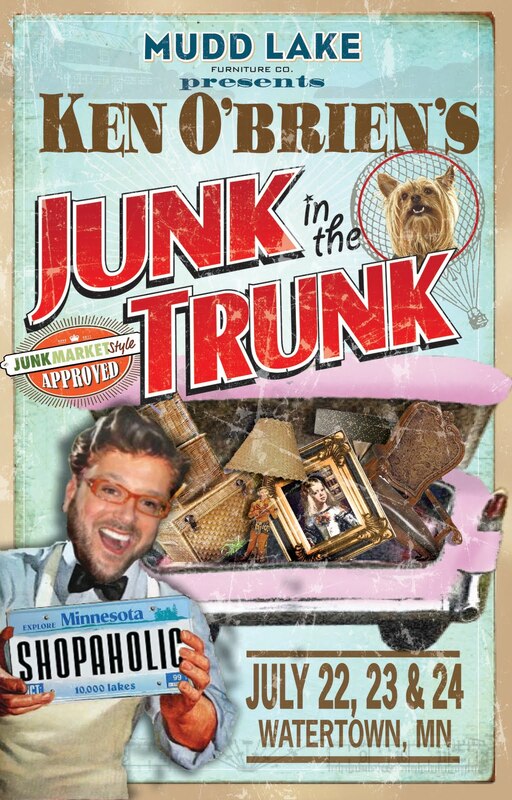 This event is "Junk Market Style" approved. What does being Junk Market Approved mean?? Well..it means that this junk vendor show is going to be phenomenol and kinda big deal in the world of antiques and "junk". Not only am I going to be attending and shopping...we...J & J Inspirations...will be selling our aprons there! Check out Mudd Lake Furniture's official website and also join their Facebook page! You are sure to be instantly inspired! Oh, and if you go to their website...you will see my arm in an orange sweater on the main page! ha! This is definitely NOT your average junk show and definitely not something you will want to miss! If you would like to tell your friends about the show, feel free to share the flier on your blog! Just be sure to link back and tell us if you do!